There’s been a lot of talk on social media lately about knitting and mental health issues, particularly aplayfulday‘s #makegoodfeelgood campaign. I’ve been on sick leave for more than a year due to problems with depression and anxiety. Through this time I may have knitted different, less challenging, things than I would if I was well but I continue to make things. I find it helps to be doing something productive and the process of knitting is relaxing (most of the time). Knitting doesn’t only help me in the moment, it also helps me to connect with other people. Having depression can make people very isolated, especially if, like me, they develop agoraphobic tendencies. I’ve really enjoyed going to knitting events and talking to other knitters this year. Finding people who are just as interested as you are in that unusual hat construction, or the quest for the perfect needles is a great way to feel connected. While there are support groups for people with mental health issues, I’d rather talk about knitting than my personal issues any day of the week. Periscope has also helped me to find like-minded knitters to talk to. For the uninitiated Periscope is a Twitter offshoot that allows people to broadcast videos and get responses in real time. There is a community of knitting periscopers and I can either just watch if I’m having a quiet day or comment if I’m feeling better. I’m far too camera-shy to scope myself, but I really appreciate the people who do. Lately I’ve been knitting for Knit for Peace, a charity who distributes knitted goods to people in need. 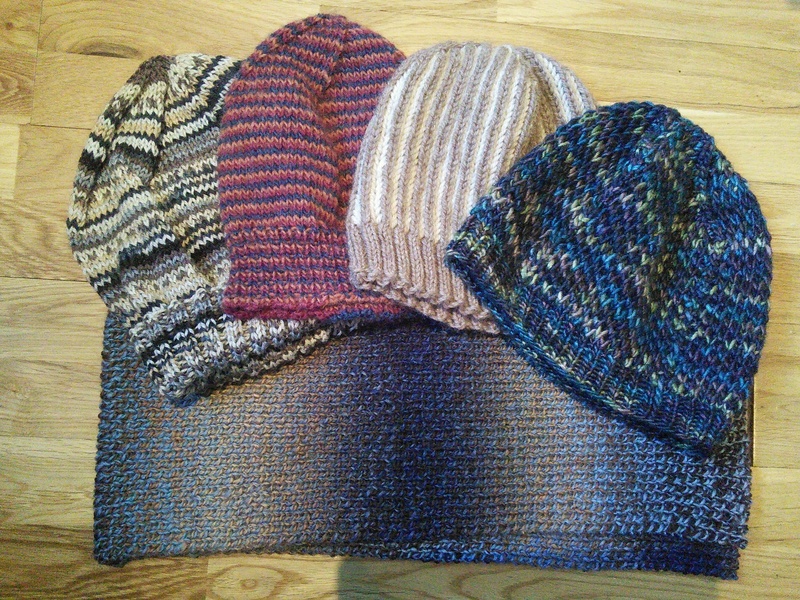 I’ve found this a great way to use up some of my leftovers (which were threatening to take over my flat) and satiate my need to knit hats when I already have plenty (until I lose the current set). It looks like this winter is going to be terrible weather wise and given the international situation at the moment, there are plenty of people who are going to be spending it in far less than optimal conditions. A hat isn’t much but hopefully it will keep someone a bit warmer and let them know that there are people who want to help. There’s a plain stocking stitch hat in Adriafil Knitcol, a hat with helical stripes in Wendy Ramsdale DK, an Opari from Ysolda Teague’s Knitworthy in Stylecraft Ethical Twist 70/30 and Chrysanthemum frutescens Hat from The Knitter’s Curiosity Cabinet in Manos del Uruguay Silk Blend as well as a 1×1 ribbed scarf in Sirdar Escape DK. I found the brioche in Opari and Chrysanthemum frutescens really interesting as I hadn’t done this much before.